Ravyn Lenae’s demands for her audience were simple. In between the R&B singer’s spacey electro-soul verses, she would say: “Dance,” or, “Y’all can just close your eyes, okay?” She electrified the crowd—all from onstage while sitting down. Listeners mumbled “okay” in response, and started moving their bodies; people who had been sitting on the ground to just listen became active participants in the performance. 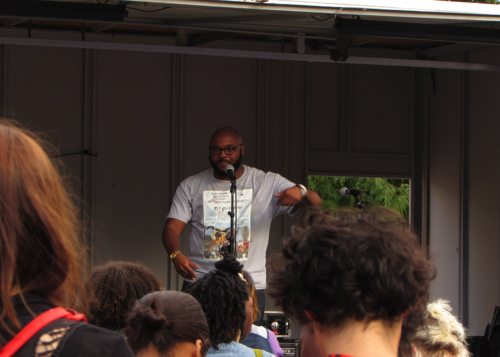 This back and forth between performer and audience echoed throughout last Saturday, when poets, artists, musicians, and community members gathered on the street to revel in art with each other at Bronzeville’s historic YMCA. 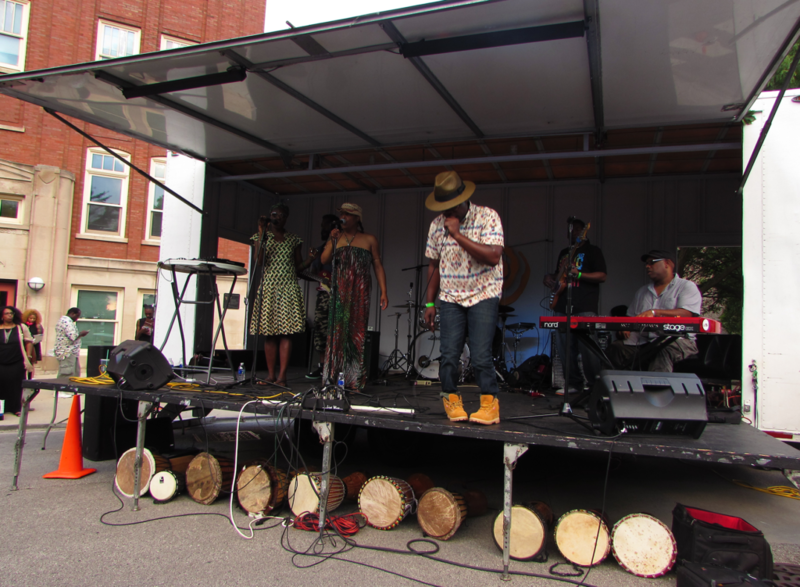 Crescendo Literary’s and the Poetry Foundation’s Poetry Block Party, at 37th Street and Wabash Avenue, sought to bring together Chicagoans in appreciation of poetry, regardless of their familiarity with the medium. Tables manned by local political and arts-oriented organizations like Assata’s Daughters and For the People Artists Collective welcomed newcomers. Beyond the entrance, local poets led workshops, and audience members had their turn onstage too, for an open mic. Interspersed throughout were performances by Fatimah Asghar, Jose Olivarez, Porsha Oyaliwola, and Ric Wilson, as well as event organizers Eve Ewing and Nate Marshall. A surprisingly natural intimacy took hold as poets delivered their lines a few feet away from block partygoers chalking their own poetry and doodles on the street. One of these chalking partygoers was Yara Daoud, a Palestinian-American poet from the south suburbs, who told me she was “trying to make a name for [herself] in the Chicago poetry community.” As Daoud chalked her original lines, “these words sting more than your oppression,” about the complexities of learning Arabic, onto the block’s concrete, people gathered round and asked about her experiences as a Palestinian-American. A few feet away, Lenae continued to groove from her seat onstage, as people stood snapping their fingers and moving their hips. How can I get into this program that on the block?